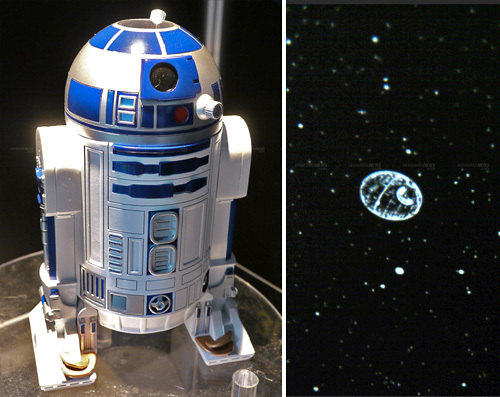 R2-D2 Planetarium May Not Be Scientifically Accurate | OhGizmo! LEGO Star Wars Sandcrawler = 10,000 Pieces + 9 Months Work… Utinni! By Andrew Liszewski on 06/16/11 • Leave a comment! It’s hard to fault any product that incorporates the Star Wars Universe’s most lovable astromech droid. But something tells me this R2-D2 themed planetarium from Sega Toys isn’t quite scientifically accurate. It still looks like a fun way to light up a kid’s room, just as long as you’re ok when they ask you why they can’t see the Death Star looming overheard when they stare up at the real night sky. Available in Japan sometime in September for under $87 (¥7,000).